Before I released the Jewish Food Hero Cookbook, I sent a some recipes to a few friends and bloggers for a bit of feedback. What did they think about the mock chopped liver? Were they intimidated by plant-based recipes? At the risk of being unpopular (or telling you things you’d prefer not to hear) oils aren’t health food. Which is why I don’t use them in my recipes, except in one instance for Purim. A few years ago, I didn’t think much about oil. In fact, I was sure it was healthy for my family and me. I made vinaigrettes for my husband, dribbled it atop soups for decorative flourish, I even made an egg-free version of olive oil cake. “Healthy fats!” the magazines tell us. “This is a healthy oil” is what we tell each other in discussion. “Lower likelihood of cardiovascular disease,” we’d all repeat to ourselves while swirling our bread around in a shallow dish of that golden goodness. And then I took this class. And promptly reconsidered the oil-is-good-for-me stance. Did you know that oil has 120 calories per tablespoon?! That’s more than most premium ice creams. That means you could eat half a cup of your favorite ice cream flavor for the same calories as the two tablespoons of oil you placed in your healthy soup recipe. (This example is meant to be illustrative rather than prescriptive). Do you know how much protein olive oil has? Or how many vitamins? Or how much fiber? Big ‘ol zeros in every category. How do you feel after eating a big bowl of stew accompanied by a nice hunk of thick rustic bread? How do you feel after drinking a liter of Diet Coke and a pile of rice cakes? I’m just guessing here, but I imagine you feel full, happy, satiated after the former and, well, still hungry after the latter because it is just empty. Oils are not satiating. They don’t make us feel full. They don’t signal our brains that we’ve eaten enough and our needs are met. When I think about this things I loved to put oil on – crusty breads, fresh heirloom tomatoes, edamame – I realize that really? The delicious aspect of that dish was the bread or the tomatoes, not the oil. The oil was just something I was adding because I thought it was really good for me. But I’ve changed my mindset (through education) and habits (by trying and doing). For the last three years I’ve been living without oils, replacing them in both cooking and baking. 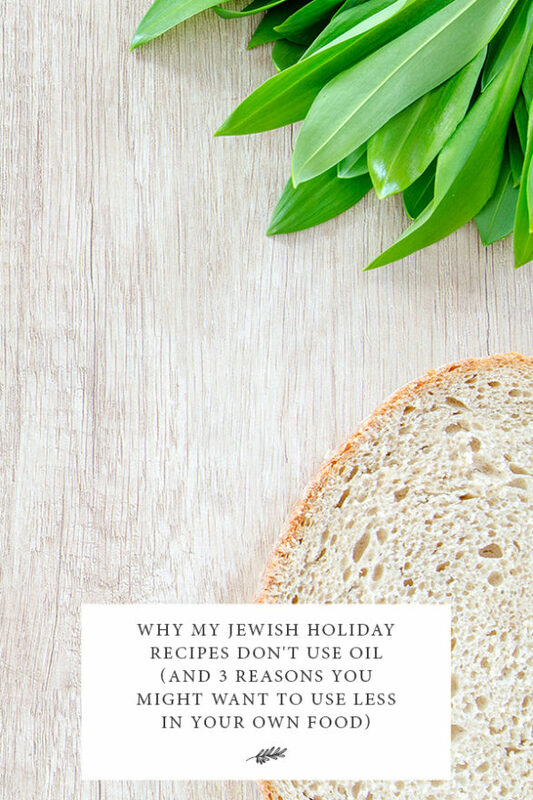 When I developed my Jewish Food Hero Cookbook recipes, I opted out of oil except for one instance of using a tiny bit of oil in the Purim menu – to get the perfect shape of those Hamentachen cookies, of course! Instead, I used ingredients like broth, starch purees, lemon juice, maple syrup, applesauce, and small amounts of nut butters to keep my recipes healthy, moist, flavorful, and delicious. There is absolutely no beneficial nutrient that is in cocoa, or coffee or coconut or olive oil or wine that you can’t already get in healthy plant foods like fruits, veggies, whole grains, beans, etc. Sometimes, these foods are praised for their high amounts of a nutrient but realize, on a healthy diet based on fruits, veggies, whole grains, legumes, we are already getting in more than adequate amounts of all these nutrients. And, in food, once you get in enough, there is no situation where more is better and in some cases, more may be harmful. For us student types here is a 5 minute lecture on oil that you might like. Your turn: Watch the video and let me know what you think about oil for you. Previous What’s On Your Rosh Hashanah Playlist, Jennifer Elsner?